WITH only moments to spare, a man and his dog were rescued by police officers before their minivan was engulfed by flames during a grass fire near Marlborough this morning. At about 11am officers were conducting patrols at Kunwarara when they spotted a large blaze burning at Grosvenor Park. While police diverted traffic around the smoke they heard a loud crash within the haze after a minivan collided with the rear of the truck. The minivan lost control and veered off the road just metres from the blaze. Amazing body cam footage captured the moment police officers aided the 74-year-old male driver whose minivan was stuck in the grass. A man and his dog were rescued by police officers before their minivan was engulfed by flames during a grass fire near Marlborough this morning. One officer rushed to the passenger side to grab the elderly man's pooch and take it to safety. The other officer was repeatedly yelling to the man to get out of the vehicle, with flames approaching the minivan quickly. Soon after the man and dog were safely away from the fire, the van was completely destroyed after becoming engulfed in flames. 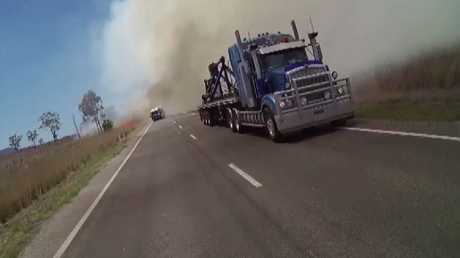 The vision also captured a semi-trailer emerging from the smoke at significant speed, causing police to urge motorists to slow down in extreme conditions, particularly when driving through smoke hazards.